Carol Harrington of Washington Borough in Warren County peered out her back window and saw these bears having a blast on her hammock. The hammock survived. There are few greater feelings of leisure than those had while lounging in a big cozy hammock on a cool summer day. But as one curious bear family discovered, finding tranquility on that swinging outdoor furniture is not nearly as easy as some folks might make it seem. New Jersey resident Carol Harrington recently captured this amusing footage of a mother bear and her cubs trying to make the most of her woven hammock, suspended between two trees in her backyard. As the video begins, one of the happy youngsters is shown hoisting himself atop it, only to go tumbling off a few moments later. Persistence does eventually pay off, but simply trying to relax has never looked like so much work. 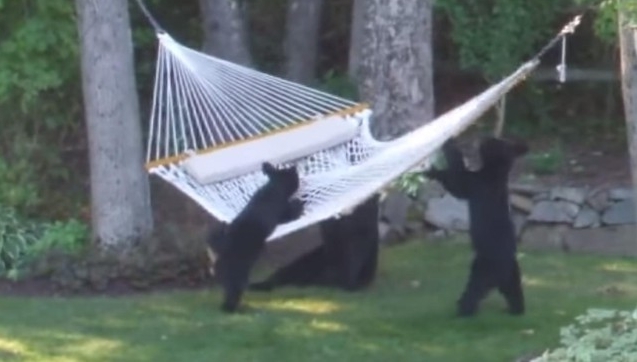 Despite the bears' indelicate handling of her furniture, we are happy to report that Harrington told radio station New Jersey 101.5 that the hammock survived the experience. Responses to "Bear Family Discovers Hammock Isn't As Relaxing As It Looks"
Your dog just can't seem to make up his mind.....bark and get told not to or just go for it.